As you many know from a previous post, I was the lucky winner of Tilly’s new Coco pattern from Ginger’s Sew Grateful giveaway! I loved the pattern as soon as it came out, and was thrilled to get my own copy so quickly. So of course I had to sew one up ASAP! I was so excited after winning the pattern that I immediately went to Grey’s Fabric to pick up some awesome fabric (before this past Wednesday, of course!). The pattern calls for stable knits without much stretch, which was a nice contrast from the super slinky knits I’ve been working with recently. I found an amazingly drapey double knit in two great colors, navy and orange, so I decided to take the opportunity to do some contrasting colorblocking. I chose the 3/4 sleeve option so that I could do a contrasting cuff, and I also chopped 4″ off the bottom of the pattern and turned it into a contrasting hem panel. I’m super pleased with the result! In case you’re wondering, the orange flower is from a Princeton University alumni reunion; I didn’t make one especially for this outfit :P. Though it does match quite nicely! I ended up making a size 2 through the bust and grading out to a size 3 from the waist to the hem. 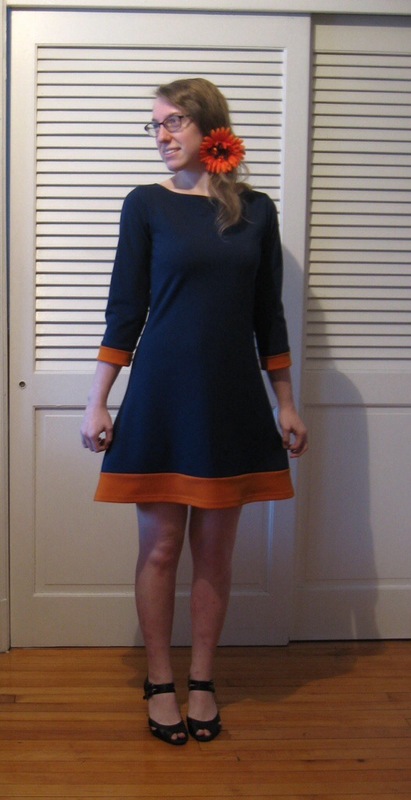 I had been afraid that the sheath dress style would be unflattering, but I’m actually quite pleased with the fit! It’s a very simple pattern with classic design lines, so I imagine it probably works for most folks. 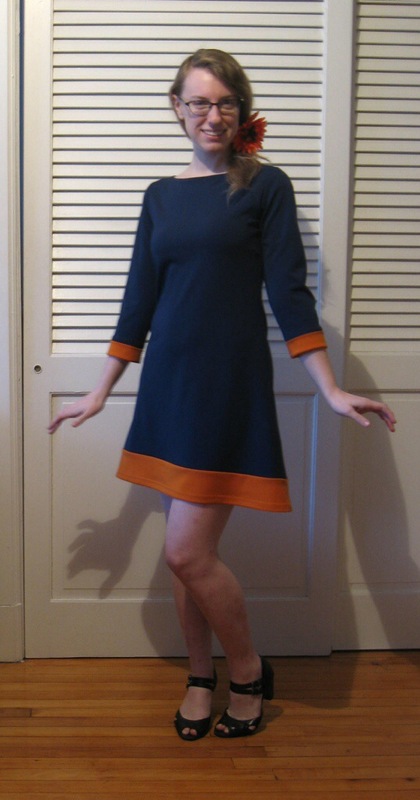 After reading through Tilly’s awesomely thorough sewalong, I decided to make the dress entirely with my machine even though I have a serger. 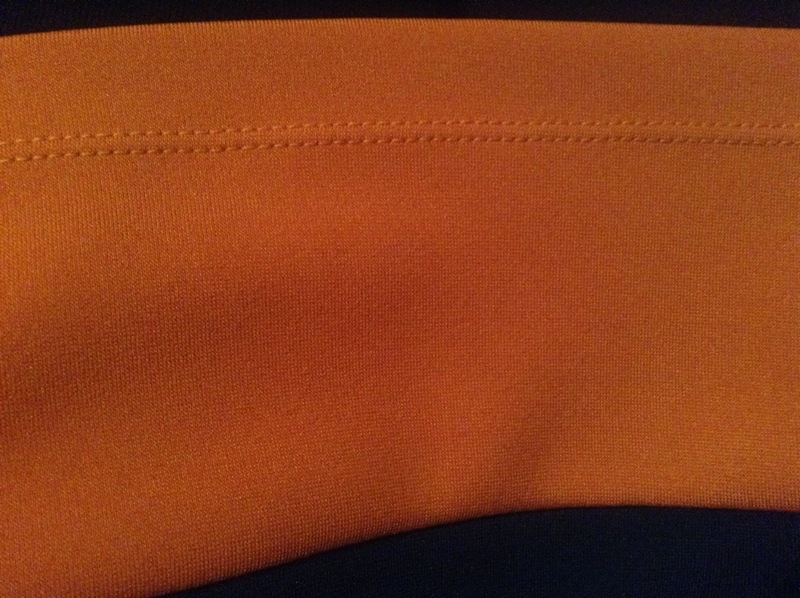 The fabric is very strong – tough fibers and a tight knit – so I was afraid it might “fight back” with the serger blade. My machine handled it quite nicely, though, so I’m glad I made that choice! I finished my hems with a double needle instead of a zig-zag, but aside from that I pretty much followed her directions. They are very beginner-friendly, so this is the perfect opportunity if you’re new to knits! Speaking of being new to knits, have y’all seen Sarai’s post about a new book on sewing with knits? I’m super excited!! Anywho, thank you so much, Ginger, for this awesome pattern – I am truly *sew* grateful! Looks great! I always did like blues and oranges mixed together. Thanks! It’s a pretty daring combo for me, but so far I’m loving it! Oh wow, I love your colour blocking! It looks amazing! This is so adorable! I love the colors you used! Thanks! I think this is pretty much the only way I can get away with wearing orange – ha! Love your colour blocking here it looks fab! Thank you! Color blocking knits is one my of new favorite tricks to jazz things up! This my fave Coco to date, you look fabulous and cool. One of my fave Cocos out there! Love the contrast. So sweet of you to say – it’s one of my favorite dresses, period!